Ny forskning visar att konsumenter köper mer sjömat, både hållbart certifierad och icke-certifierad, när de blir informerade om eko-märkning. Med hjälp av tidigare undersökningar som visat sig att priset och smaken är viktigast för konsumenten när de köper fisk och skaldjur, och att köparna har en tendens att köpa samma produkter som vänner och familjemedlemmar, bestämde forskare vid Norges teknisk-naturvetenskapliga universitet (NTNU) för att testa vad som skulle hända om butikskunder fick veta att många andra kunder köpte Marine Stewardship Council (MSC) märkta skaldjur. "Vi ville motivera människor att äta mer hållbar fisk och skaldjur, men istället motiverade vi dem att äta mer av alla sorters skaldjur - inklusive icke-hållbara alternativ. Miljömärkning är en mycket vanlig form av hållbar kommunikation, så det var viktigt för oss för att ta reda på vad som verkligen hände här, säger Richter. Shoppers will buy larger quantities of seafood – both sustainably certified and non-certified – when given information about eco-labels, new research has found. Isabel Richter's doctoral research in environmental psychology at NTNU explored how people could be motivated to eat more sustainable seafood. She was granted permission to carry out an experiment in grocery stores in Norway and Germany. 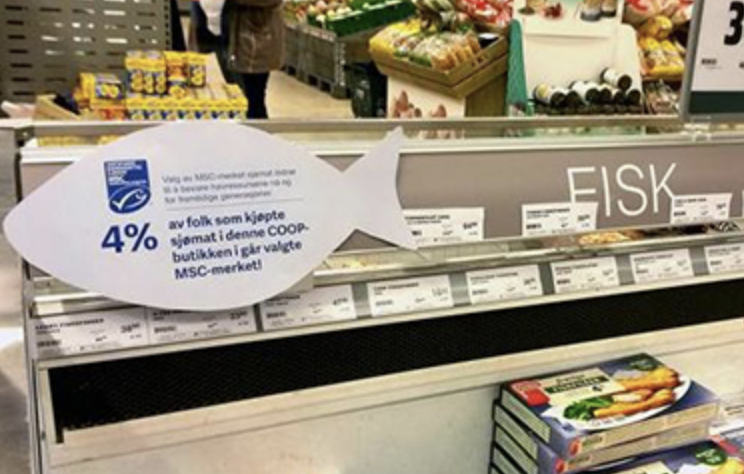 Richter and her colleagues assumed that more customers would choose MSC-labeled products in the stores where they were told that more than half of the other customers bought MSC-labelled seafood. But that wasn't how it went. "We wanted to motivate people to eat more sustainable seafood, but instead we motivated them to eat more of all kinds of seafood – including non-sustainable options. Eco-labeling is a very common form of sustainability communication, so it was important for us to find out what had really happened here," said Richter. She created a virtual store, where participants in the study could freely choose different groceries from the shelves. They were given EUR 20 (USD 22.82) each to shop with. The items had no familiar brand names, but they had labels that communicated different messages, including that products were sustainable. Some had labels with nothing on them. However, before the virtual shopping tour, participants were presented with a variety of messages – such as a picture of a fish and text stating whether the fish was healthy or unhealthy – without knowing that this was part of the experiment. The researchers presumed that people would buy more of the products marked with a message, regardless of whether the message was positive or negative, if they had seen the product before. And that was what they saw. "Even if you tell consumers that milk prevents osteoporosis, 'milk' is the only thing they remember," said Richter. "If customers are encouraged to buy organic cucumbers, it's just 'cucumbers' they want. If we recommend that people eat less of something and at the same time, we mention the entire product category, people are motivated to eat more of everything in that product category." "We think what might work is to communicate what customers should do, and not what they shouldn't do." For example, Richter said if people were asked not to choose endangered tuna the next time, they buy sushi, they'll just want to have tuna. Instead, it should be recommended that they choose sustainable scallops for their sushi, she said. "Maybe the labels would have worked better if there'd been just one label for all sustainable products. So many different labels are out there now,” she said. 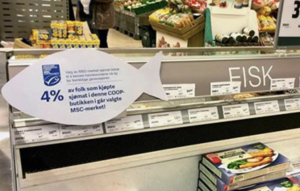 "And even without the eco-label, fish already has so many other labels: the Nordic keyhole label, that it's antibiotic-free, locally produced, and so on. People don't know what all the different labels mean."